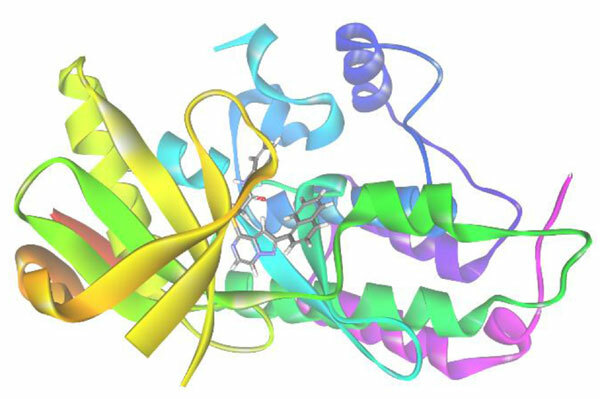 Background: Since the introduction of Gleevec in 2001, protein kinases have been explored as therapeutic targets for the treatment of several cancers. Specifically, anaplastic lymphoma kinase (ALK), a receptor tyrosine kinase belonging to the insulin receptor superfamily, plays an important role in anaplastic large-cell lymphomas (ALCLs) and non-small cell lung carcinomas (NSCLCs). The first inhibitor of ALK, Crizotinib, was launched in 2011 but, due to the rapid emergence of resistance, the development of new inhibitors is still necessary. Herein we describe the use of in silico methods to identify potential ALK inhibitors, with putative low toxicity and favorable pharmacokinetic profiles. Method: We used the 3-D structures of seven inhibitors of ALK to generate a pharmacophore model, which was screened against a database of commercial substances. The resulting 75,000 compounds were then analyzed by shape-fitting rigid body docking and the top 10% scored compounds were rescored via flexible ligand-docking. The ten best-ranked ligands had their most probable binding modes predicted with the aid of the analyses of the molecular interaction fields. Predicted toxicities and pharmacokinetic properties were then studied in order to identify the most promising candidates for ALK inhibitor therapy. Results: From the ten best-ranked compounds, six were predicted to perform H-bonds with the amino acids bearing the binding site of ALK: compounds 8, 10, 12, 13, 15 and 17. Favorable druglikeness scores were observed for three of these compounds, 10, 12 and 15, and for other three compounds: 11, 14, and 16. Alerts for toxicity were observed for 11 (tumorigenicity), 14 and 15 (severe and moderate teratogenicity, respectively). Conclusion: From the ten best-ranked ligands, two compounds (10 and 12) seem to be particularly attractive due to the good predicted binding affinities, adequate pharmacokinetic profiles and low toxicity. Also, they may be subjected to pharmacophoric and bioiosteric replacements to produce analogues with reduced structural complexity/better synthetic accessibility, two central issues in lead optimization and scale up synthesis. Abstract:Background: Since the introduction of Gleevec in 2001, protein kinases have been explored as therapeutic targets for the treatment of several cancers. Specifically, anaplastic lymphoma kinase (ALK), a receptor tyrosine kinase belonging to the insulin receptor superfamily, plays an important role in anaplastic large-cell lymphomas (ALCLs) and non-small cell lung carcinomas (NSCLCs). The first inhibitor of ALK, Crizotinib, was launched in 2011 but, due to the rapid emergence of resistance, the development of new inhibitors is still necessary. Herein we describe the use of in silico methods to identify potential ALK inhibitors, with putative low toxicity and favorable pharmacokinetic profiles.